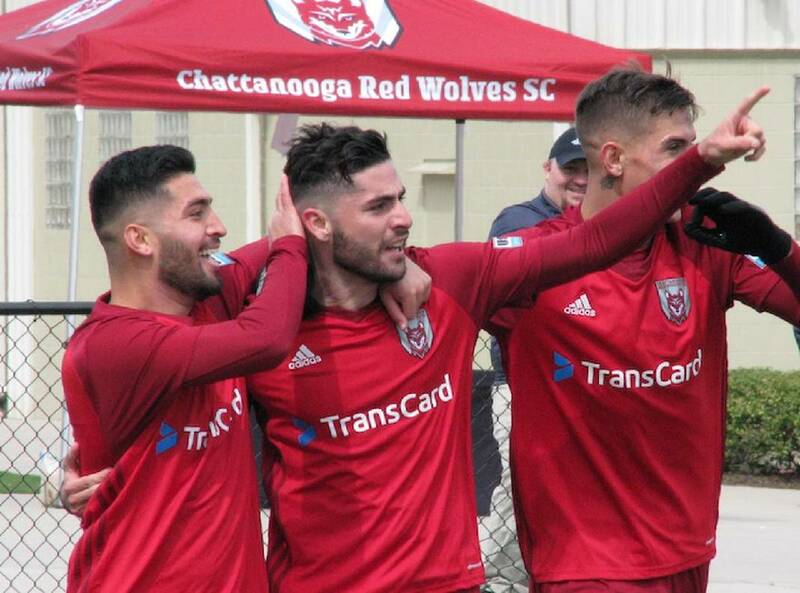 Chattanooga Red Wolves defender Jonathan Caparelli, center, celebrates with teammates after scoring in the 88th minute against Louisville City FC during an exhibition match Saturday at Chattanooga Christian School. The soccer teams played to a 1-1 draw. Photo by Patrick MacCoon /Times Free Press. Chattanooga Red Wolves defender Andrew Moullin goes high in the air to head the ball against Louisville City FC. The soccer exhibition ended in a 1-1 tie Saturday at Chattanooga Christian School's David Stanton Field. Chattanooga Red Wolves defenders deflect a shot by a Louisville City FC attacker Saturday during a 1-1 exhibition draw Saturday at Chattanooga Christian School. Instead of letting frustration build from missing a handful of great looks early at the back net, the Chattanooga Red Wolves kept pushing to find a break. The USL League One soccer club did break through in the 88th minute as Jonathan Caparelli placed a shot between the Louisville City FC goalkeeper's legs. The goal rewarded a pass dropped in the left side of the box by Amirgy Pineda. 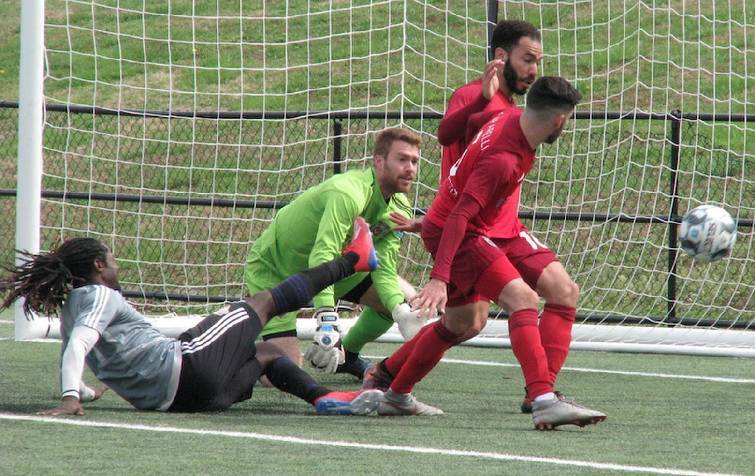 In front of more than 300 spectators at Chattanooga Christian's David Stanton Field on a cold Saturday, the Red Wolves tied 1-1 in an exhibition against Louisville City, which has won the past two USL Championship cups. "The biggest thing today is we did not give up," said the 23-year-old Caparelli, who scored a team-high three goals in as many preseason games. "We were all over them early but had to keep fighting. When Amirgy came in, I told him to play me that ball, and he did perfectly." Pineda entered in the 79th minute and soon after found the versatile wingback for the equalizer on the Red Wolves' 13th and final shot. Louisville City finished with eight shots, which included Magnus Rasmussen's score right before halftime. Rasmussen was one of the visitors' few regulars playing a day after they won 1-0 against Atlanta United 2. Chattanooga's Josue Soto had a free kick ricochet off the right post, and it nearly was cleaned up by Sito Seoane in the 21st minute. Eamon Zayed drew several fouls and had an early score called back. Steven Beattie created continual pressure in the first half as he laced strong shots and made dangerous passes along with Ualefi dos Reis and Richard Dixon. "We could have scored two or three goals in the first half, but nobody panicked," Red Wolves coach Tim Hankinson said. "We have to finish those attacks and get more crosses and shots, though. A key for us is to go through Connor (Doyle) and Ualefi in the midfield a little more." Capitalizing late, Caparelli celebrated his equalizer with his teammates and the crowd with gusto. "I was happy to see our fans who came to support us in the cold weather," Caparelli said. "I am excited for a historic season ahead. We need their support all the way through." On the defensive end for the Red Wolves, Alex Mangels made a diving deflection on a powerful free kick. Tony Walls and Andrew Moullin played strong in the air and anchored the back line. Also having tied Atlanta United 2 at home this preseason, the Red Wolves now will prepare for their USL League One season debut March 30 at North Texas SC in Dallas. "The foundation is laid, and we are ready for the season to begin," Hankinson said. "These guys have worked extremely hard over the last six weeks of preseason and are ready to play the real 90 (minutes)."